The San Pedro Roman Catholic School (SPRCS) held a small ceremony for the inauguration on the renovations of the bathroom facilities on Thursday, November 28, 2013. With a student population of nearly 900, the school’s bathroom facilities were in dire need of upgrading and renovations. The pleas of the school did not fall on deaf ears as UNICEF wasted no time in jumping on the project and provided financial aid for the project. Delivering the welcome address was Mayor Daniel Guerrero who stated that the Town Council, along with UNICEF, has been working hand in hand to make much needed improvements in schools and different areas of the island. He stressed on the importance of civic pride and asked the children of SPRCS to take care of the newly renovated facilities. On Friday, November 29, the San Pedro Roman Catholic School and the New Horizon S.D.A. 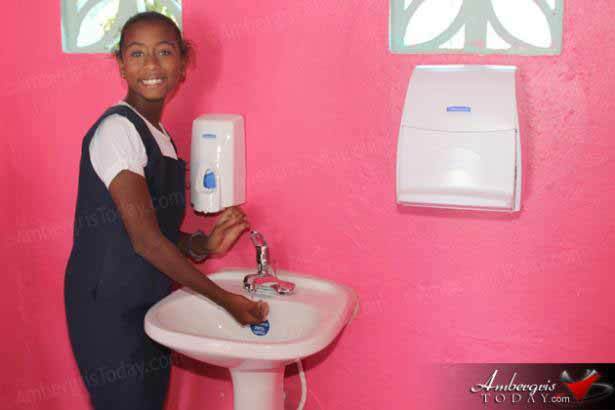 School hosted an inauguration ceremony for the bathroom renovations they currently received on behalf of UNICEF. At both inaugurations, the students made a demonstration on how to properly wash our hands. Both schools formed a Quality Child Friendly School Committee where parents and school members are involved in the well being of the children. This committee will also be responsible for the upkeep of the bathrooms and make sure that everything is in order. Am I the only one this bothers? An island with so many wealthy residents and part time owners, but UNISEF must rebuild the schools bathrooms? I know I know..but just so troubling. "An island with so many wealthy residents and part time owners". The majority of the island is working class with some middle class plus the very few 1%. From what I see the 1% do contribute heavily. There are just so many causes that people get overwhelmed. There are many, many people that contribute and many prefer to remain anonymous. IMO, this is a perfect example of the lack of taxes being returned to the island from Central Government. Simon yes I understand. An those that contribute are amazing. I guess it is just the juxtaposition of it all. I wish I could contribute more..to the many that just needs the basics. JZB nailed it. Even something this basic and needed is not addressed with taxpayer money. It's outrageous and yet we just take it on the chin.